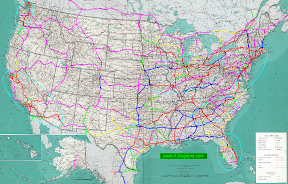 The Federal Railroad Administration's designated HSR corridors with some criticism. A proposal from The Transport Politic, with a followup. US HSR has a plan that projects build-out through 2050. America 2050 also has a plan that is based on the concept of megaregions. The Infrastucturist has mashup of several different proposals. The VHSR group has a nice map of existing Amtrak routes and population estimates of another set of megaregions. I have my own proposal, but before talking about it let me back up a bit and cover some basics. First, what is HSR? Internationally, it's defined as a fixed guide-way transportation system that operates regularly at speeds above 240 kph (150 mph). In the US it has been defined by the Federal Railroad Administration (FRA) as railroad transportation that can travel in excess of 110 mph (175 kph). The international definition covers both conventional rail and magnetic levitation systems. For the rest of this post I'm going to define HSR as conventional steel-on-steel trains and track that allow for regular operation above 150 mph. I'm also going to add two other definitions that are unique to me: MSR as conventional rail that travels at speeds up to 110 mph, and SSR as conventional rail that that travels at speeds up to 80 mph. Second, what kind of equipment does HSR require? All currently implemented HSR networks use trainsets powered by electricity provided by an overhead catenary system. This combination isn't the only possibility, but it's definitely the best one. Electric power is better for this application than a diesel-electric combination because hauling around a large prime mover (a railroad term for the engine, which is separate from the motors powering each axle) and its fuel supply isn't necessary. And with diesel power, more than one locomotive would be necessary to meet the required power. Electric power is better than a gas turbine-electric combination because turbines are very inefficient in this application. An overhead catenary is better for providing electricity than the only other option, third rail, for safety reasons. A trainset is better than a separate locomotive pulling independent cars because a trainset can be more easily made aerodynamic, access between cars is better, and they are more attractive. (Some HSR designs have two semi-permanent, integrated locomotives that push and pull a set of articulated cars, instead of being part of the articulated set.) For MSR and SSR, diesel becomes viable, though electricity is still better in many situations. A dedicated trainset is still best at all speeds, but legacy locomotives and cars work as long as they are well maintained. Third, what kind of track does HSR require? A HSR trainset can operate on any electrified track provided the voltage is correct, but requires a separate, fenced-off, dedicated set of tracks free of grade crossings in order to operate at maximum speeds. HSR needs to be separate because the track has to be built to a much higher standard than for MSR or SSR, because mixing speeds slows down traffic substantially, and because heavy freight trains cause much more wear and tear than lighter passenger trains. A dedicated line can also have grades that are too steep for freight traffic. In most HSR networks the trainsets operate on dedicated track outside of city centers and merge with general traffic for the last few miles. MSR and SSR do not have to be segregated, but the track needs to be in better shape than for freight-only traffic. MSR needs to have an in-cab signaling system installed on the line, as does HSR, but SSR can operate on traditional trackside indicators. MSR also requires all grade crossings that can't be eliminated be protected with large, complex gates. Finally, where should HSR go? Because of the high cost of building dedicated track, HSR is only viable between major population centers. Additionally, when compared to aircraft, HSR is competitive only for trips of up to 3 hours, or 300-400 miles. The number of stops must be limited in order for the average speed to stay up, as does the amount of time spent on low-speed lines, in order to have an advantage over cars. So, there's a lot of stuff to consider when planning a HSR network even before tackling issues like geography and existing conditions. Let's look at a potential line. Auburn, pop. 28,574, MP ? Herkimer, pop. 7,498, MP ? Rensselaer, pop. 853,919 (in Albany MSA), MP ? When set out like this, most of the destinations are obvious (Buffalo, Rochester, Syracuse, Utica, Albany, Springfield, Worcester, and Boston). Others aren't. Schenectady is too close to Albany to be added for a stop on its own merits, but existing conditions mean a stop would have a low penalty. I would also include Newton because Boston is such a big metropolitan area that traveling into the city center can be prohibitive. A similar suburban spot could be added near Buffalo, but the majority of the population lies to the north or south of downtown, making the added utility smaller. But wait, you say, the line being discussed is much longer than 400 miles. That's true, and somebody going from Buffalo to Boston would most likely fly (at current prices). However, there are so many intermediate destinations with considerable populations that the entire line would be heavily utilized. The line also intersects with several others: HSR lines at Buffalo, Albany, and Boston; and MSR lines at Buffalo, Syracuse, Springfield, and Boston. Many trains could run on the corridor for only part of their routes before branching off, which would increase utilization even more. So, using my rather imprecise technique, this looks like a very good line to include in a HSR network. Where else should HSR go? To answer that in a semi-methodical way, we could look at the US metro area rankings, and see if any groupings emerge. I've done that, and here is what I saw. I've used the Census Bureau's MSA definitions, so a few larger megalopolises have more than one entry. Marginally attached cities are in parenthesis, and logical extensions into Canada and Mexico are in brackets. The results are fairly encouraging, because 38 of the top 40 cities in America, which have populations of 1.3 million or more, can be organized into 7 different regions. The three strongest regions are the Northeast (where the MSR-ish Northeast Corridor already exists), the Southwest, and the Midwest. The groupings get a bit shakier over 40 due to distance and intermediate density. Four top 60 cities will never be on a national priority network due to geographic isolation: Honolulu (obviously), Denver, Salt Lake City, and Albuquerque. Some people like connecting the last two, but there are very few residents between Pueblo, CO, and Albuquerque, and the geography is punishing. Nashville and Memphis are just a little too far from everything else to fall into any region. Using the groupings above, a list of the top 200 cities, and various bits of specific knowledge that have lodged in my brain over time, I've come up with the network below. A few more comments are in order. Unlike most plans, New Orleans is a stub, not a hub. This is because I think the Gulf Coast line should be well away from the ocean whenever possible. In some places I have bent the route from straight in order to build a triangle that could connect more routes. One in Texas has already been proposed, and I added a small one in Illinois and a large one in Tennessee. I included some state capitals that are marginal, but that was for inevitable political reasons. Finally, the colors. Red is for the core national lines, all of which should be built to HSR standards. Blue is for nationally important lines, which would be best built to HSR standards, but could work as MSR lines. Green is for lines that are significant for a state or region, but probably merit only MSR standards at best. And yellow is for examples of MSR or SSR infill or spur lines, and is not meant to be comprehensive. Kinda crappy looking, eh? I hope to find a better base map to work off. Okay, time to step back again. The underlying assumption for this plan and most other plans is that we will be operating in a more-or-less business-as-usual (BAU) mode in 2050 or 2100. Most of our cities will still be car-centric and car dependent, gas (or other fuel) will be cheap, and airplanes will be affordable enough to dominate city-to-city traffic over 400 miles. That assumption could be entirely wrong. A lot of peak oil adherents believe that transportation will be entirely different by 2100, and that a program to electrify every existing rail line should be started immediately. Only after that should HSR be built. That plan does better reflect the reality of existing North American rail transportation: it is freight centric. As such, it operates quite well - if you are on a main corridor and need hundreds of carloadings per year. Most HSR plans, including mine, fudge or ignore the issue of freight. That's a big problem, because most MSR and SSR routes would run on existing right-of-ways, albeit with much improved track. If freight can't be kept moving at a good pace, a lot of it will end up on the highways, which would be a big negative. Another major problem with most HSR proposals, again including mine, is relatively weak treatment of Canada and Mexico. That might sound like an odd criticism when the starting point of the whole discussion was funding from the US government. But America and Canada are heavily integrated economically and culturally, so the border there should not weigh too heavily on route planning. The US-Mexico border is much more problematic, to say the least. At this point, future HSR or MSR connections should be planned only at the high level. As for specific lines, the Windsor-Quebec City corridor is obvious and everyone includes it, but other lines should be considered as well. For instance, a small isolated MSR network might be viable in Nova Scotia and New Brunswick. An isolated HSR line is being planned for the Edmonton-Calgary corridor, and there is potential for MSR connections to other western cities. Mexico is in desperate need of passenger rail, as very little exists. There are seven potential locations for crossing the border: San Diego, Yuma, Nogales, El Paso, Laredo, McAllen, and Brownsville. Beyond that I don't know much about Mexican cities or geography, but I hope to add lines for that country soon. Finally, by their nature, no national plan gets down into the weeds. Some regional plans do; for instance, the California HSR proposal is quite detailed, and environmental reviews are already underway for some segments. Elsewhere, though, millions of devilish details remain undiscovered. The biggest problem will be acquiring the right of way. The endless sprawl that covers the country east of the Mississippi might lead to hundreds of billions of dollars being spent in order to develop reasonable routings. NIMBYism will reach new heights once a specific route is proposed, as there is no denying that a train blasting through at 150 mph makes quite a racket, even if it is brief. Every mile of every segment will have to go through an arduous approval process before a single tie can be laid. So enjoy the pretty maps you see popping up all over. You won't be seeing actual HSR in the US until at least 2020.